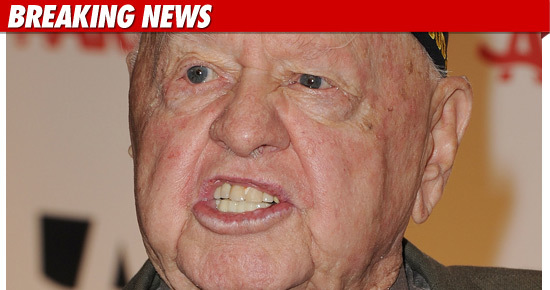 Mickey Rooney's stepson has just been ordered to stay 100 yards away from the 90-year-old actor -- on grounds he "threatens, intimidates ... and harasses Mickey" ... and is trying to steal his fortune. An L.A. judge issued the stay-away order today -- after the actor's 52-year-old stepson Christopher Aber allegedly tried to coerce Rooney into signing over his assets. Aber's wife has also been ordered to stay away from the actor. But money ain't all Mickey's worried about -- according to his petition, "Mickey is extremely fearful that Chris will become physically threatening against Mickey and may even attempt to kidnap Mickey from his home." In fact, Mickey asked the judge to appoint a temporary conservator to protect his assets in the wake of his stepson's alleged threats. The judge granted his request and appointed Rooney's lawyer to serve as conservator. Unofficial MJ Memorial -- Katherine in the House!